The name of this garment comes from the English language, the jacket is a calques of the word "pea-jacket" (pea – a kind of coarse cloth, jacket jacket, jacket). The main features of the jacket, both male and female, a fold — over collar with lapels, decorative buttons on sleeves, side and chest pockets. For the best fit outwear sew on the lining, so there are several features in the manufacture of this thing. Pick up a ready-made pattern of the jacket. Fold the fabric in half face inside and cutting the product. Patterns place, given the direction of the grain lines. Detail cut out, leaving all the slices at 1.5 cm for seams and 4cm for a hem on the bottom of sleeves and bottom of jacket. Similar parts will have plenty of lining fabric, not including the lapels. Sew Darts and Princess seams on the shelves. Zautyuzhte them in the side sections. On the back sew the middle seam. To make the jacket look perfect, you must carefully carry out the heat treatment of all welds. Do it through a damp protohellenic (suitable gauze or other cotton cloth). To the upper part of the valve, the collar and podbora glue the interlining. Fold one interlining duplicated and not duplicated by laying the details of the flaps and sew them to the external slices. Allowance for the seam, cut close to the stitching and remove the parts on the front side. The seam is smooth and mimetite before the heat processing parts. Then proceed to the design of Welt pockets. Fold the piece in half right side out and baste it above the pocket marking on the shelf so that its fold coincides with the line. The detail stitch on the sewing machine. Then attach the flap and sew it. Cut the shelf between the sutures and the leaflets of the valve. Fold the leaf up, and valve over the slot, priutyuzhte details. One of the parts of burlap to sew the seam allowances leaves, and the second to the bleed valve, loosen them on the wrong side of the shelves. Small triangles, obtained while cutting the pocket, fold inside out and Topstitch them on the leaf and burlap. Fold the details of the burlap and sew them. Align the parts of shelves and back of the jacket and sew shoulder and side seams. Sections were treated overlong seam is not necessary. Fold details of collar and sew them on the outside. 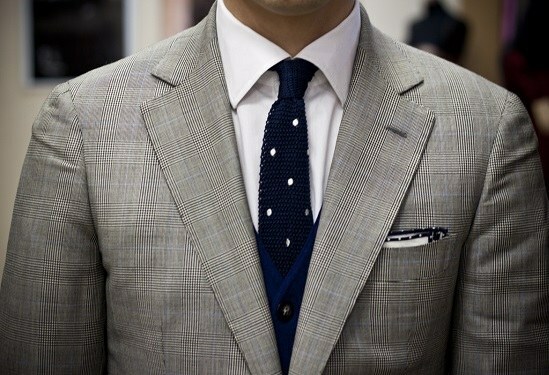 The upper collar should be a few millimeters wider than the bottom. It is necessary that in the finished product the corners of the collar not curled up. Remove the detail on the front side. Carefully smooth the seam. Insert the collar between the jacket, facing and podborany. All the details baste and sew on the machine. The lapels turn on the front side. Unscrew the facing up and stitch allowances of seams vrachevanie at a distance of 2-3 mm from the line. Fold the facing down. Treat the slots of the sleeves. Sew the side seams. Lifts slightly proposedida both parts and vacate them into the openings. Fold hem to wrong side and zautyuzhte it. Along the slots handle loops for the buttons, but not parasite them, connect the sleeve and sew on 3 small buttons. Sew shoulder pads to shoulder seams. To jacket keep in shape, it is necessary to put it on the lining. On the back of the line the middle parts astrocyte at the top and bottom at a distance of 5 cm crease free fit. Zautyuzhte it. On the lining sew the Darts, perform side and shoulder seams and sew detail to podborta and the facing of the neck. Then insert it in the upper part of the jacket wrong side to the wrong side of the product. Fold the bottom sections of their sleeves, and hem with hidden stitches by hand. In the same way treat the bottom of the jacket. Sewn loop on the left shelf for a male model or on the right for a woman's jacket. In the second half, sew flat buttons.